Nothing beats coming home to the classic taste of sayote and ground pork, especially when it’s cooked with Knorr Liquid Seasoning and Knorr Pork Cubes. ½ pc. sayote, sliced into bite-size pcs. 1 Here’s one way of serving vegetables in a non-challenging way. By adding sayote, it makes this humble dish more nutritious. 2 Begin by sautéing the onions and garlic in a pre-heated pan with a little bit of oil. Cook them until the vegetables give off a nice aroma. 3 Throw in the Knorr Pork Cube and mix well until dissolved before adding the ground pork. 4 When the pork is slightly toasted, gently add the sayote, and pour the water. Simmer these over medium heat until cooked through. Now give this a nice sprinkling of Knorr Liquid Seasoning and pepper to taste. 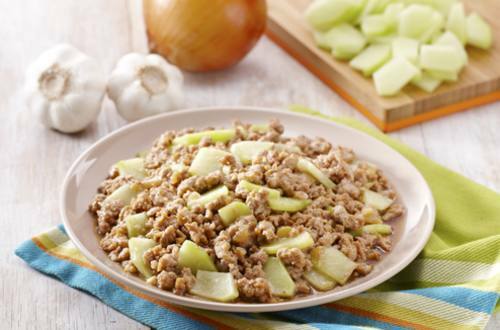 5 Pork and Sayote Guisado is one of those dishes that can soothe a hungry stomach. Sometimes, it’s simply the answer to a tired person’s work week.